At an education-focused event in Chicago, Apple announced more than just a stylus-friendly iPad. The company also revealed some new features coming to its office and productivity software, as well as new education tools for teachers, school administrators, and developers. All told, the event seemed like Apple’s way of saying something it’s been wanting to say for some time: Stop buying Chromebooks, please. Instead of joining Google in a race to the bottom in terms of inexpensive hardware, Apple is playing to its strengths, boasting about its ecosystem of “over 200,000” educational apps and updated classroom management tools to woo both students and teachers. Sorry, the iPad still starts at $329 (or $299 after Apple’s standard education discount), though it’s faster than the previous model and comes with Apple Pencil support, which is pretty cool. Apple’s first software announcement was an update that’s coming today to its iWork suite of office apps for iOS and macOS (that’s Pages, Numbers, and Keynote). The list of new features includes Apple Pencil support and “smart annotation,” which Apple says will enable teachers to mark up their students’ documents directly. Students will also be able to collaborate inside the apps and create group projects. And there’s a new book creation tool coming to the iOS and macOS versions of Pages. How similar this is to Apple’s circa-2012 iBooks Author software, we’ll know soon enough. For teachers, Apple is highlighting two apps: the preexisting Classroom app and a new app called Schoolwork. 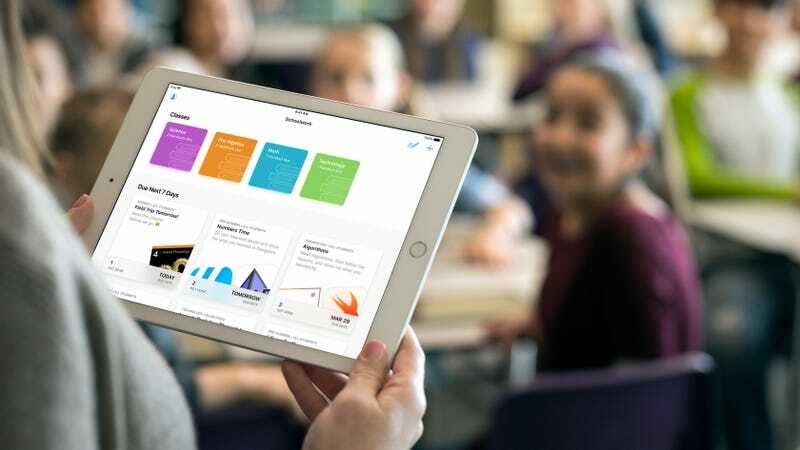 The updated Classroom app, available in June for macOS, was designed to help teachers guide their students through lessons, granting them the power to broadcast apps, books, and sites to every student’s iPad, and to share students’ screens during class. The brand new Schoolwork app, meanwhile, was made to help teachers keep tabs on their students’ activity and assign homework. Developers will be able to integrate third-party apps into Schoolwork via the ClassKit API. Available in June, the app will also let teachers make “handouts” that can link to other education apps. They can assign specific activities within apps as well, as long as developers update their apps to include ClassKit support. For schools, Apple says its new School Manager software will make it easier to manage a stock of iPads and a database of Apple IDs either individually or in bulk. The features should help schools deal with dozens of iPads, hundreds of students, and limited IT support. As an added perk, Apple says students with “Managed Apple IDs” (provided by schools) will also receive 200GB in free iCloud storage, a huge boost from the pitiful 5GB previously offered. It would have been nice if Apple dropped the iPad’s price by a few bucks now that Google’s latest education gambit includes the $329 Acer Chromebook Tab 10, the first tablet to run Chrome OS instead of Android. It’s got a USB-C port, the same 9.7-inch screen size and resolution as the iPad, and a built-in stylus. Instead of cheaper prices, however, Apple’s plan to compete with Google is all about software. And if its plan works, Apple could sell a boatload of iPads to schools—no discount required.